Poll: What Kind of PvE Do You Prefer? Whenever I read people talking about their progress in 10-man raiding, my immediate response is to hope they can get into 25-mans soon for their sakes. I know that’s completely irrational of me; a number of 10-man encounters are more challenging than their 25-man counterparts, and plenty of people are happier in the smaller raid sizes, fo various reasons. I sincerely believe 10-man raids are just as real and valid as 25s. But! I prefer 25s, and it’s so hard not to project this when I’m thinking about what other people want out of the game. So please educate me, gentle readers – everything else being equal, what kind of PvE content do you prefer? So, beta build 9014 landed on us overnight, and the paladin forums exploded in a storm of weeping – and pretty justified, too, I feel. Heck, people were upset enough that the main forum thread about it grew 16 pages overnight. Infusion of Light no longer gives instant Holy Lights. Instead, it reduces cast time by 1 second. Divine Plea is now confirmed to return 25% of mana, last 15 seconds, and reduce healing by 100% while active. Infusion of Light is still nerfed – which is very disappointing, because it was the only talent that really felt fun – but Ghostcrawler has just posted that Divine Plea will be changed to a 20% healing debuff, instead of 100%, but DP will now be dispellable to compensate for it which seems like a pretty good tradeoff to me. Somehow I managed to get the first response on the thread, but as I posted further down, I think it’s a pretty smart change. Until now, the premiere healing spec for paladins post-3.0 has been a Holy/Ret hybrid build, 37/0/34, which goes deep enough in Holy to get Infusion of Light and deep enough in Ret to get Judgements of the Wise. This is largely because anything deeper in Holy is fairly average – the 51-point talent, Beacon of Light, is situationally groovy but not a must-have (it’s hideously expensive, and doesn’t proc off overheal), and everything between Infusion of Light and Beacon of Light ranges from ho-hum (Divine Illumination) to downright awful (Sacred Cleansing). 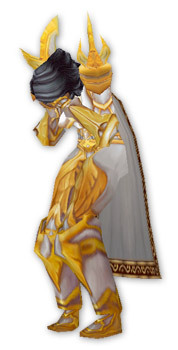 Making Divine Plea suddenly pretty awesome for healadins is a very smart choice. It means we’ll be regenning a decent chunk of mana in PvE every minute. Which means we don’t feel compelled to take JotW any more, because we won’t have mana woes that necessitate it. Which means we’re more likely to go deeper in Holy to take Beacon of Light (or Bacon of Light, as Ghostcrawler calls it) because JotW doesn’t look so ridiculously awesome next to it any more.